The last day of summer is, officially, September 21st. The truth is summer has ended for the majority of us. We are back to school or back to work but the memories of summer linger. I am sure more than a few of us hope to squeeze out few more days of summer revelry before the weather changes and we pack up the flip flops and pull out the sweaters. All the "Fall Preview" issues and articles have come out but I am not quite ready to let summer go. The reality of being back has hit me square in the face so I need to look back and review summer 2013, especially our vacation, and share it. Hopefully it will give you some ideas for summer 2014. It is always good to have something to look forward to. Route 1 runs along the coast of Maine. From York to Bucksport you will pass through some of the loveliest towns imaginable. Towns like Kennebunkport and Camden look as if they are a postcard come to life. Even Freeport, the home of L.L. Bean, manages to feel somewhat charming despite the town essentially being an outdoor mall. This is the Maine most people visit and think about. Things change at the town of Ellsworth. This is the last truly big town with a downtown and a big commercial center you will encounter if you proceed northeast on route one. Ellsworth is where you turn south to go to Blue Hill, Deer Isle, Bar Harbor & Mt Desert Island. Ellsworth is also the starting point of the part of Maine known as Down East. Down East is the coast of Maine that runs from Ellsworth to Lubec (the Easternmost point of the United States) on up to Calais and the Canadian Border. As you you head out of Ellsworth you start to notice the different feel in this part of Maine. It is less built up, wilder and more rural. While there are people "from away", this is not the summer destination southern Maine is. It is harder to maintain a business Down East. Those who can survive the winter to take advantage of the fleeting summer season consider themselves lucky. It is an annual ritual for those who spend their summers here to see who survived the winter and what new places have embraced the optimism of spring and have decided to make a go of it. The Gouldsboro Peninsula is known for the town of Winter Harbor and the Schoodic Peninsula, the only part of Acadia National Park that is on the mainland of Maine. On the Eastern side of the Gouldsboro Peninsula sits Corea Harbor. Corea Harbor is relatively small but it is one of the most picturesque harbors you will see in Maine. It also happens to be situated right where Gouldsboro Bay meets the Atlantic, prime lobster territory. The reason you would seek out Corea lies at the end of Crowley Island Road. Crowley Island Road follows along the northern edge of the harbor's long, thin arm, and does a hairpin turn to run back along the southern edge. The road dead ends at the water and the Corea Lobster Co-op. Here, at the end of the dock, you will find lobster men pulling up in their boats and unloading the day's catch. They will ask you if you want "hard shells" or "shedders," how many you want and what size. Figure around $4/lb for shedders, $6/lb for hard shell. Maybe less. This is the ultimate in "locavore" eating, and it has been going on in Maine forever. 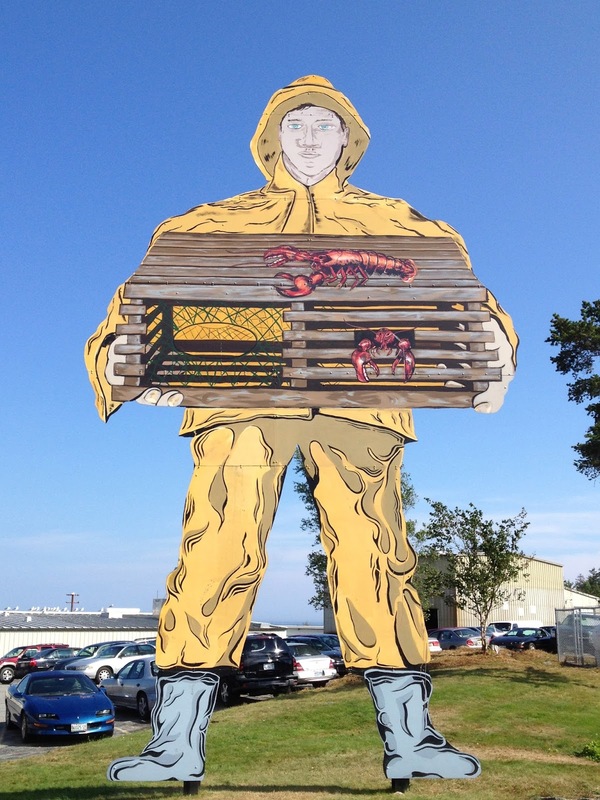 Nothing is better that buying lobster, fresh out of the cold Maine waters, from the guys who caught it. This summer, something new popped up on Corea Road, just past the turn for Crowley Island Road. Someone converted two old lobster shacks on a dock into the Corea Wharf Galley, a lobster roll and seafood spot. Genius. The shack on the left is the order window and where the fridges are. The cart out front is the kitchen. Simple menu. All you need. We tried the lobster roll, $10.95. As meaty and fresh as you can get. Stone crab claws, $8.25. Generous and just out of the water. A nice grilled cheese for $2.50. If you are looking for proof your seafood isn't flash frozen meat, and watching them fish out the crabs and lobster from the tank isn't enough, just check the buckets. Take that perfect grilled cheese. Stuff it with fresh lobster. Devour. This is why we are here. Great food. Great price. The view? Corea Harbor. The low, long building is the Co-op. Summer is a hard fought reward in Maine. They suffer through long winters for days like these, places like these. Here is hoping Corea Wharf Galley makes it through this winter to see another summer. This is heaven. This is Maine. Corea Wharf Galley. Corea Road, Corea, ME. Yeah, long winters kill the desire to dream big. When I lived there, I was just astonished to see how people are adapted to those winters. I was a student without money, having used these guys paper writing services for my last university exam. I will be planning a summer vacation here! I've never been there. But I can use your notes. You can use my service to get a persuasive essay if you need it. Feel free to do that.